At her confirmation in 1597, she took the name of Rose, because, when an infant, her face had been seen transformed by a mystical rose. As a child she was remarkable for a great reverence, and pronounced love, for all things relating to God. This so took possession of her that thenceforth her life was given up to prayer and mortification. She had an intense devotion to the Infant Jesus and His Blessed Mother, before whose altar she spent hours. She was scrupulously obedient and of untiring industry, making rapid progress by earnest attention to her parents’ instruction, to her studies, and to her domestic work, especially with her needle. Her days were filled with acts of charity and industry, her exquisite lace and embroidery helping to support her home, while her nights were devoted to prayer and penance. When her work permitted, she retired to a little grotto which she had built, with her brother’s aid, in their small garden, and there passed her nights in solitude and prayer. Overcoming the opposition of her parents, and with the consent of her confessor, she was allowed later to become practically a recluse in this cell, save for her visits to the Blessed Sacrament. In her twentieth year she received the habit of St. Dominic. Thereafter she redoubled the severity and variety of her penances to a heroic degree, wearing constantly a metal spiked crown, concealed by roses, and an iron chain about her waist. Days passed without food, save a draught of gall mixed with bitter herbs. When she could no longer stand, she sought repose on a bed constructed by herself, of broken glass, stone, potsherds, and thorns. She admitted that the thought of lying down on it made her tremble with dread. Fourteen years this martyrdom of her body continued without relaxation, but not without consolation. Our Lord revealed Himself to her frequently, flooding her soul with such inexpressible peace and joy as to leave her in ecstasy four hours. At these times she offered to Him all her mortifications and penances in expiation for offences against His Divine Majesty, for the idolatry of her country, for the conversion of sinners, and for the souls in Purgatory. Many miracles followed her death. She was beatified by Clement IX, in 1667, and canonized in 1671 by Clement X, the first American to be so honored. 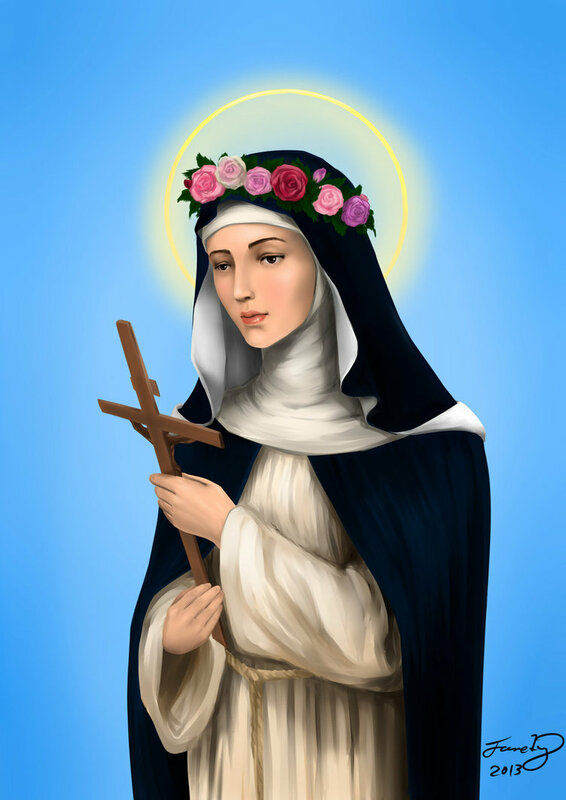 Her feast is celebrated 30 August. She is represented wearing a crown of roses.